View Cart "100 levs, 2014, Bulgarian Iconography, St. Prophet Elijah" was successfully added to your cart. The obverse of the coin features the logo of the Bulgarian National Bank with the year ‘1879’ written on the ribbon. 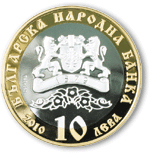 In circumference is the wording ‘БЪЛГАРСКА НАРОДНА БАНКА’ (BULGARIAN NATIONAL BANK), the year of issue ‘2010’, and the nominal value of the coin ‘2 ЛЕВА’ (BGN 2). The reverse of the coin features a plastic art interpretation by the authors of the design of Zahariy Zograf’s self-portrait displayed in the National Art Gallery, and the wording ‘200 години от рождението на Захарий Зограф’ (‘200 Years since the Birth of Zahariy Zograf’).